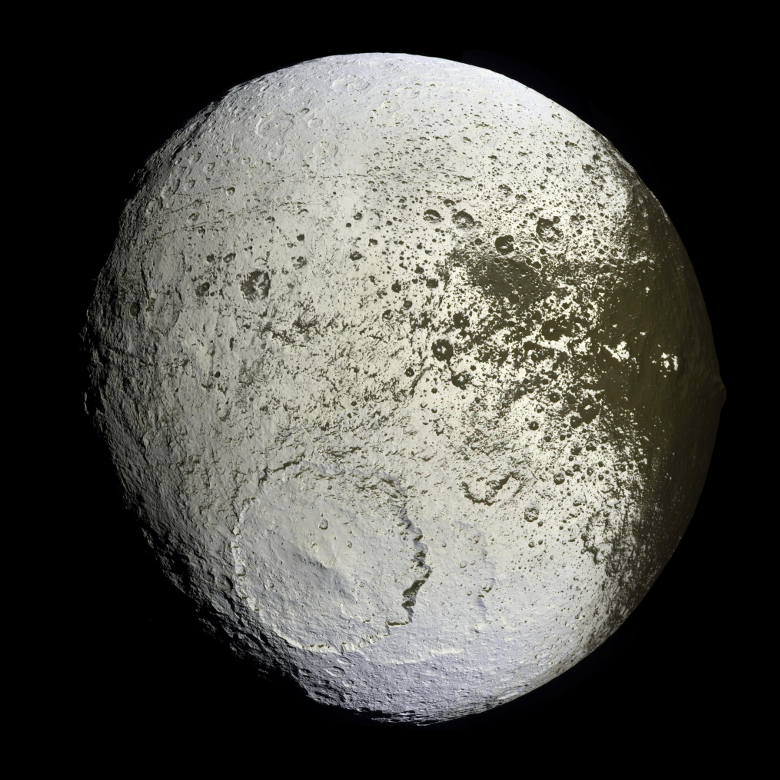 Iapetus is an oddly-colored and shaped moon of Saturn. It is the third-largest moon in the system, and was discovered in 1671 by the astronomer Giovanni Domenico Cassini. Iapetus comes from the name of a Greek Titan, following along in the tradition of calling Saturn’s moons after the Titans. Iapetus has a bright and a dark hemisphere, with a ridge running along its equator. The dark region is called Cassini Regio and is the principal feature of the leading hemisphere. The surface of Iapetus is heavily cratered, with large impact basins up to 580 kilometres across. Surface darkening on Iapetus comes from organic materials left behind as ice in the warmer Cassini Region region sublimates. The dark patches seem to be made of organic materials similar to those found in early meteorites or comets. There is also a suggestion that some material may have come from outside Iapetus. Iapetus’s equatorial ridge runs along 1,300 kilometres through the central region of the moon. It is about 20 kilometres wide and towers up 13 kilometres over the surrounding surface. No one is quite sure why or how it formed. The Voyager and Cassini missions have led in the exploration of Iapetus. Cassini has been able to study it over longer periods of time. Iapetus’s orbit is inclined to the plane of Saturn and is also quite far away. This makes it the only large moon from which an observer could see the rings. There currently no missions planned to explore Iapetus in the near future.